Driving on the left of the median, cars to the left and right. With a late summer influx of visitors expected, one of Kyrgyzstan’s most important roads is just barely finished. BISHKEK — The road from Manas International Airport to Bishkek is technically a straight shot, and newly paved. But straight on a map and straight sitting in the front seat of a 1997 Toyota Camry with two impressive cracks in the windshield driving on the wrong side of the road as the sun rises over the mountains is a different matter. Despite the smooth ride, the road wasn’t quite completely finished and the traffic pattern erratic around dawn on August 27. Shortly after leaving the airport, the string of cars was directed to cross over from the right to the left side of the road by a blockade of traffic cones. On the other side of the median–where we should be driving–there was supposed to be construction. However, it was 6:30 am and I saw no one out just yet aside from the man setting up cones. Eventually, we followed a few cars back to the right side of the median–though some continued on the left. The Bishkek-Manas road is just one of a number of prominent projects, necessary but mired in construction delays, accusations of shoddy work, and for some, questions over corruption in the award of contracts. Arguably one of the most important roads in the country, connecting the Manas International Airport to the capital, the Bishkek-Manas road had been a work in progress since early 2015. The hope was that the road from the airport to the capital would be completed in time for the Commonwealth of Independent States jubilee summit in mid-September. Earlier deadlines have been set and passed but the ultimate deadline is September 17 when the leaders of the former Soviet world descend on the city. In May 2016, 24.kg reported that the Finance Ministry, found “[a]t least 753.5 million soms… for the reconstruction of Bishkek-Manas airport road and 500 million soms for the controversial project on reconstruction of Balykchy-Korumdu road.” In June, Parliamentarians lamented that the road had not been finished for the full summer tourism season, but urged Prime Minister Sooronbay Jeenbekov to monitor the road’s quality. “Funding issues are solved, the committee supported allocation of billion som for this project, the main thing now — to build a high-quality road, so that tourists feel comfortable,” Taalaibek Masabirov of the Kyrgyzstan party said, addressing Jeenbekov. A month later the prime minister visited the road and found it unsatisfactory. 24.kg reported that a representative from Technotop (the contractor) “assured that, at the time of road commission it will be no worse than the road Bishkek-Naryn-Torugart.” The comparison may not be that favorable as the Bishkek-Naryn-Torugart road, which passed through the famous Boom Gorge, has experienced a number of rockslides and mudflows after rainfall. Some have attributed that road’s troubles to shoddy construction–mostly poor drainage–by the Chinese company contracted to improve the road. As August progressed, dates were set for completion for the Bishkek-Manas road and then pushed back. The price tag had reportedly pushed beyond 950 million som. The contractor said last week that all the asphalt had been laid but that signs and markings were not finished. 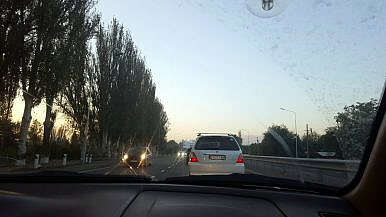 About halfway to Bishkek, we hit traffic. Several cars were ahead of us, slowing, and a man was setting out traffic cones across the roadway. As if by divine providence, Michael Jackson’s Smooth Criminal came on the radio. To the chorus–“Annie are you okay? Are you okay, are you okay, Annie?”–my driver knew exactly what to do about the stoppage: turn around and start driving back the way we’d come. For a surreal minute we drove with the median on our right, cars to both the left and on the other side of the median driving in the opposite direction. We followed a van that had turned to go back also until coming upon a cut in the median that let us cross over. Kyrgyzstan’s infrastructure needs are considerable, and in addition to the delays experienced by construction projects of all kinds the world over, corruption remains a serious concern for Bishkek. The present prime minister needs only look to his immediate predecessor for what the political taint of a road gone wrong can do. With so many visitors expected in the next few weeks, the road looks to be done just in time. Former presidential candidate Omurbek Babanov canceled plans to return to Kyrgyzstan, a year and a half after he fled the country.